Dawn Dove speaking to the respectful listeners at the “on site” dedication. 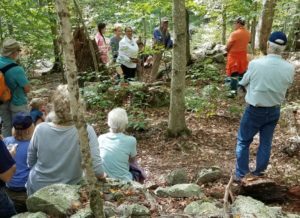 But what is so special about this newest addition to the superb assortment of trails on the Hopkinton Land Trust properties? The one word answer is “history”. The longer answer is Manitou Hassannash Preserve protects 14 acres of land where there is an intermingling of colonial/settler/indigenous archaeology remaining on Brightman Hill. The centerpiece of the colonial/settler archaeology is the family cemetery of colonist Thomas Brightman, who fought in the Revolutionary War. The centerpiece of the indigenous archaeology is the “wander zone”, an extremely dense area of spirit stone groupings, known in the Algonquin language as manitou hassannash. I used the word unique at the beginning of this page for a reason. It is my belief that while this preserve has already been researched for four years already, with 1,100 manitou hassannash already GPSed and on file with the state of Rhode Island, and one archaeology book completely dedicated to this area alone, (Land of a Thousand Cairns by Mary Gage and James Gage). That is a lot of attention to a small space, but possibly the densest ceremonial stone landscape site in all of Rhode Island. However, in my opinion, it is likely to be the site of intensifying research for years to come, because of its density, the intermingling of european and indigenous eras, and the intriguing theories presented to describe how/why this site is of such significance to the indigenous culture and our understanding of Hopkinton’s history. Much of this research is intended to further the application of Manitou Hassannash Preserve for recognition as a national historic place. Currently there are no ceremonial stone landscapes so honored located east of the Mississippi River. The nomination process takes time, and copious documentation, but that process is already well on its way. But with the attention Manitou Hassannash Preserve will draw in the years to come, archaeological features are fragile, even if made of stone. Accordingly, there is no trail planned for Manitou Hassannash Preserve to reduce traffic. To compensate for this difficulty, there are two narrated video tours of Manitou Hassannash Preserve on line at YouTube, as well as complete video coverage of all Ceremonial Stone Landscape Day events: The dedication, as described above, and all five educational talks as described below.